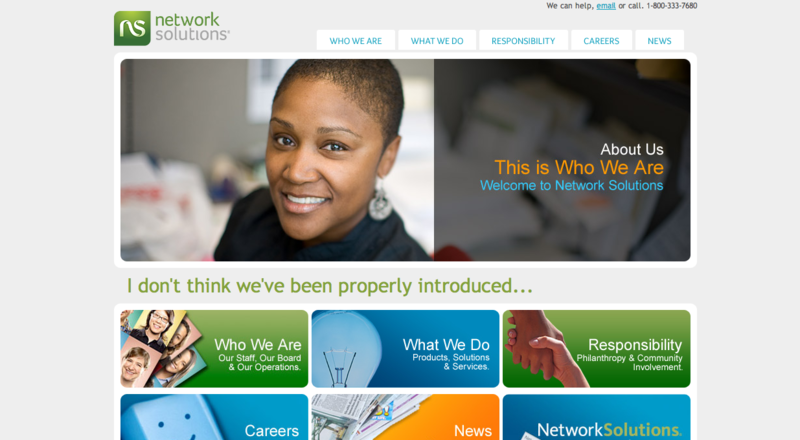 Network Solutions is a company focusing on helping small businesses use the web to their advantage. Network Solutions sports a simple design- helping companies who are not tech savvy take advantage of their services. The site is to the point, explains what they do, how they do it, and what companies can expect (obvious and easy to find and locate this information.There is more text than visual material- photos for design- dynamic materials are video (tutorias)-sneak peak/taste of services and logo links. Small businesses lacking either the knowledge or the resources to use the Internet to their companies advantage. Netowork Solutions’s goal is to supply as much service as easily accessible as possible for their tech illiterate customers. Network solutions makes their services very easy to access and easy to understand just exactly what a small business will be getting by signing up. There are sneak peaks for future customers to see what exactly the type of services that this firm can offer them. Also interesting is their eCommerce section which makes it easy to acquire services instantly. Network solutions benefits from add-on sales because of the nature of their eCommerce section on their website.